Milan really didn’t play any better tonight than they have been. It’s just that Birsa was new around here and didn’t realize he wasn’t supposed to score. But it’s just as well, because tonight belonged to the missing… the Curva Sud. Having been banned in a bizarre decision intended to take all of the fun out of the sport for fans everywhere, it was only fitting that the most mediocre and struggling Milan I can remember would give them the win. So even though the three points were desperately needed, this one was for the Curva. Allegri’s cure for missing Balotelli was to line up a 4-3-2-1 on paper. But it is clear that he told the players it was a “4-3-whatever.” I think his intention is to play every formation known to man that Matri can be the center forward in, he is that hell-bent on proving Matri’s worth. In the meantime, Matri seems to have misunderstood his purpose at Milan. He thinks he was brought back to play the same level of play as he did when he first entered Milan’s Youth Teams. Oops! Only I’m starting to believe that he was better then. But the biggest story is how when Milan play such mediocre football, they also get the clean sheet and zero cards. Which is bigger than you might think, considering that De Jong was one card away from suspension and would have missed the Juve game next week had he been booked. Also, at least as of this writing, there were no known injuries. All of these things may actually be bigger than the win itself, considering we head to Amsterdam for Tuesday’s Champions League clash with Ajax. 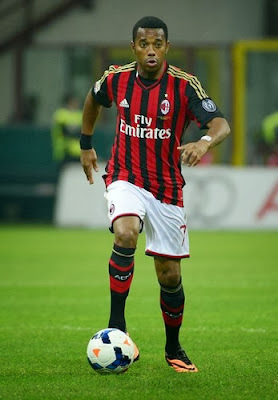 Robinho has been playing well, doesn't get the credit because everyone else is not. The first half was so bland that literally the most interesting thing that happened is that the referee, Peruzzo, successfully intercepted the ball in the 37th. Sure there were Birsa free kicks and crosses that went to waste, mainly because they were sent in to Matri, but even Robinho couldn’t quite get to one just in front of goal in the 17th. Constant did a couple of his best Boateng from distance impersonations, and in the 43rd, it seemed like De Jong took a knock that looked like it bugged him throughout the match. I’m crossing my fingers on that one. The second half opened up with a bang. Allegri subbed his favorite killer, Muntari, off for Emanuelson, and Boom! One minute in, Robinho crosses it in to Birsa who takes the shot. Goal! 1-0 Milan. He tried again 2 minutes later, was saved, and Robinho also denied on the rebound. In the 53rd, Zaccardo decided that anything Birsa could do, he could do better, so was making a nice run in on goal. But unfortunately, he was whistled for offside. Apparently the linesman knew his reputation, thought he was going for an own goal, because he actually wasn’t offside. 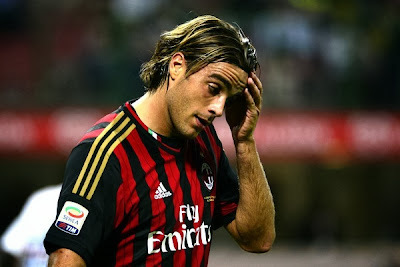 In the 64th, we saw Matri run. For a few steps. And again in the 89th, as he got run out of bounds with his mad ball handling skills. In between, he kept trying to take shots, but it got to the point that his teammates purposely seemed to overlook him and score despite him. I didn’t see him noticeably drawing the defenders or creating space, unless you count the space he made on the bench for Niang, who can’t even play on Tuesday since he was left off the list. Epic fail. Meanwhile, Allegri subbed Niang on for Birsa in the 66th. He keeps subbing Birsa off early, and I thought maybe it was a stamina issue, but tonight Birsa looked strong. While the rest of us wonder why Matri is still on, or even Robinho, who played great, but tends to run out of gas. But these questions were superceded by the fact that Delio Rossi put on Petagna at the same time as Niang came on, the ultimate battle of the young Milan forwards. But Petagna lost this one to Zaccardo, who he was mixing it up with in the 84th, and had a ripped patch on his shirt to prove it. Meanwhile, Niang had a number of shots, including one in the 91st that looked like it might have gone in were it not barely tipped by the keeper. Also, in the final minute of the match, when he was just beaten by the keeper. See Matri in the box. See Matri run. See Matri fail. Allegri, however subbed as if we were losing – the halftime sub, then Niang on in the 66th, and bringing on Nocerino for Poli in the 75th. All three subs used, none apparently for injury, and all by the 75th. And that completes the nice things I can say about Allegri portion of this review. Although I am going to refer you to every other review of late for all of the other things, because he’s simply not worth the energy it would take to re-type them. In a game where winning still feels like you’ve taken a beating, and no amount of alcohol could wash away what Milan called “football,” I was happy for one group of people: The Curva Sud. Not only did they miss the debacle, they got the result for their troubles. They deserved a win for some time now, and I’m happy that Milan gave it to them. Now we have a whopping 8 points in 6 games, one better than Gattuso’s record, so clearly Allegri will think that they played well and that we are aiming for top three. When we face Juventus next week, having already faced Napoli, maybe he will get his Scudetto bearings and realize that we are well behind the race for the top three. But while he continues to view the world from his intestines, Milan head to Amsterdam on Tuesday. Here’s hoping that with the possible return of a couple of key players, Milan will remember what the game is supposed to look like. Until then, three points is something to be grateful for. For the Curva. 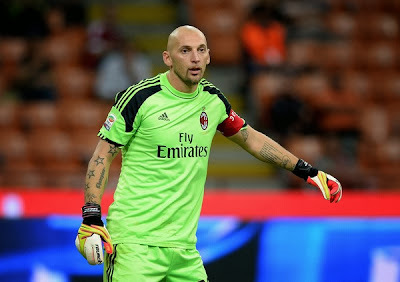 Milan Mercato: Reinforcement or Reanimation?